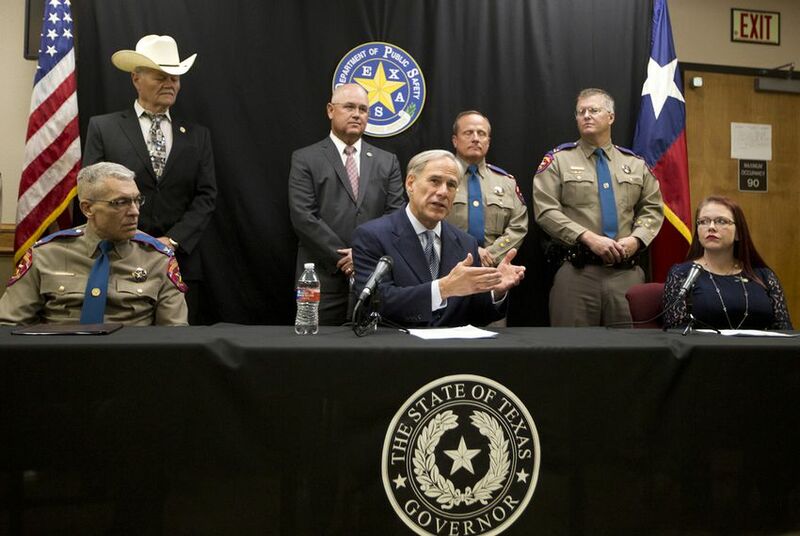 Abbott said he wanted to fix a flawed system in Texas that allowed the man suspected of killing a trooper last year to get out of jail on bond despite having been previously accused of assaulting a deputy. WACO — Gov. Greg Abbott wants the Texas Legislature to pass a bail reform law next year. On Tuesday, the Republican governor announced his proposed Damon Allen Act, named in honor of a 41-year-old highway patrol trooper who was gunned down last Thanksgiving during a traffic stop near Fairfield, about 60 miles east of Waco. The suspect, 33-year-old Dabrett Black, was out of jail on a $15,500 bond at the time after allegedly assaulting a Smith County deputy. After his murder, Allen’s widow, Kasey, approached Abbott about the issue. Abbott said it was because of her that he is supporting bail reforms in the next session, which begins in January. The judge who set Black's bond told WFAA after Allen’s death that he didn’t know of Black’s previous convictions at the time — which included a 2015 assault on another deputy — and wished he’d handled the case differently. In October, after Black was already out of jail, his bond was increased to $400,000 and an arrest warrant was later issued. Having judges and magistrates who set bail be informed of the defendant’s full criminal history and take that into account when setting bond amounts. Adding the safety of law enforcement to the list of threats judges must consider when setting bail. Implementing a statewide case management system, so judges and magistrates would have all the relevant information at bail settings. Only allowing judges, and not lower-level magistrates, to set bail in cases involving dangerous criminals. Bail reform has already been a key part of the platforms of most groups focused on criminal justice issues. Court fights against bail practices that largely keep poor, non-violent offenders in jail while similar defendants with more cash go free are ongoing in Harris, Dallas and Galveston counties. A reform bill last session by state Sen. John Whitmire, D-Houston, passed the conservative upper chamber but died in the House. Whitmire, who chairs the Senate Criminal Justice Committee, said his bill would have toughened bail-setting practices for violent offenders, like Black, by allowing judges to deny them release on bond altogether and use risk assessments to set bail for non-violent offenders or release them without payment. Abbott said at the press conference Tuesday that his proposal could be an avenue for lawmakers to include reforms for non-violent criminals, like using risk assessments to keep poor people who aren’t dangerous out of the jails. In his State of the Judiciary address last year, Texas Supreme Court Chief Justice Nathan Hecht noted that about 75 percent of people in county jails in Texas are being held there pretrial — meaning they haven’t yet been convicted of a crime. On Tuesday, Hecht issued a statement reiterating reasons to push for bail reform, including the nearly $1 billion annual cost to taxpayers to hold people in jail pretrial. Former Dallas County Sheriff Lupe Valdez, the Democratic candidate for governor, said in a statement that a discussion on bail reform must address that too many people are kept in jail simply because they're poor. She also knocked Abbott for excluding gun control from the conversation on Allen's death. "If we are going to talk about keeping our communities safe from harm, we must put in place gun safety measures including universal background checks and red flag laws, which could have kept Dabrett Black from having access to the gun that killed Officer Allen," Valdez said. Tarsha Jackson, criminal justice director of the Texas Organizing Project, a nonprofit that advocates for low-income communities and people of color, said in a statement that giving special consideration to charges like evading arrest or assault on law enforcement — charges that can be used by officers to harass black and Latino defendants — would only hurt those who are most vulnerable to the cash bail system. “It’s unfortunate that Abbott has used the tragic death of a trooper to further his agenda of incarcerating even more people of color," she said. "This isn’t going to make us safer, as he claims. It’s going to tilt the scales of justice even more against us." In working toward meaningful reforms, Whitmire said any support is welcome to overcome the powerful bail bond industry which he blames for his bill’s demise last session.